The date was July 8, 2005 when Bill Trembath his son Ben, his brother Dave, and his nephew Dan Trembath were fishing around the Dunkirk area of Lake Erie. Thats where they caught this 8 pound 12 oz walleye. The big walleye went bezerk and clobbered a watermelon colored crawler harness in about 60 feet of water. Lake Erie's Eastern Basin is considered to be trophy walleye waters. The species of fish found in Lake Erie's waters include walleye, largemouth bass, smallmouth bass, white bass, yellow perch, northern pike, chain pickerel, muskellunge, tiger muskellunge, lake trout, brown trout, rainbow trout, coho salmon, king salmon, pink salmon, rock bass, crappie, sunfish, bullheads, bowfin, white suckers, channel catfish, lake sturgeon, carp, alewives and smelt. 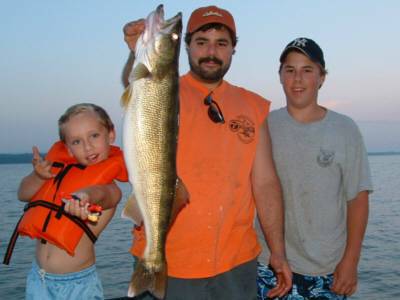 Walleyes will range in size from 16 to 24 inches on average however the eastern basin of Lake Erie is famous for trophy-size walleye which can be up to 8 to 12 pounds in size. These big walleye are mostly available to offshore trollers during the months of July and August. Lake Erie has a few secrets which are becoming very well known. The first one is the huge lake trout which have been taken recently. The NY state record lake trout was broken by Jesse Wykstra in August 2003 when he landed a 41 pound 8 oz lake trout from Lake Erie. He was fishing the Dunkirk area using an NK 28 spoon off a downrigger. The old NY state record lake trout weighed 39 lb. 8oz. There is a real chance that a bigger lake trout is swimming in the depths of Lake Ontario but for now Lake Erie will hold the new record. Another well kept secret about Lake Erie may be that the best smallmouth bass fishing in the Northeastern United States can be found here. The last five NY state record smallmouths have come from Lake Erie, with the current record standing at 8 lbs., 4 oz. Anglers can also enjoy an early bass season on Lake Erie, which runs from the 1st Saturday in May until the 3rd Saturday in June. During this early season, there is a one fish limit and 15" minimum size requirement. The third well kept secret about Lake Erie is the excellent runs of steelhead that are available to Lake Erie tributary anglers from September through April. Cattaraugus Creek has become famous throughout the Northeast for its incredible fishing. However there are many smaller streams less known that have the same quality of fishing. If you are interested in keeping tabs on the best Lake Erie Fishing Hotspots this link will keep you up to date on the action.